If the wait from book deal to physical publishing contract were a pregnancy, I’d have my suitcase packed and waiting at the door by now. My last blog post was over seven months ago. Since then, I’ve been given a pub date of August 2020 for my first historical novel and I’m told I’ll be assigned an editor this summer. While I’m excited and grateful to have a deal in the works, I had no idea that this would be such a long process. For the past seven-and-a-half months I’ve been on something of a writing hiatus, which feels weird because for most of the past five years I’ve written every day. While I’ve been waiting I’ve taught a couple of seminars and I’m working on a lecture I’ll give in June. Getting published is a waiting game, as anyone who’s been through it knows. It’s also like a carnival ride, in that at all points along the way you never know when your heart will lurch with the unexpected—that glowing skeleton drops in front of you, or you feel like you’re flying, or you know you’re going to be sick. That email announcement goes ding! And then BOOM, there it is: a request for more pages, or a request from an agent for a phone call to talk about our work, or even an offer of representation. Further down the road that BOOM is a publishing offer. But between these moments, there is an awful lot of waiting. And anxiety. But I get ahead of myself. There’s a lot that goes on before this point, believe me. Publication is not for the faint of heart. And of course, any writer reading this is probably thinking, at this moment, ‘yadda, yadda, yadda, I’ve heard this before.’ Right? Maybe. Let me tell you a little story. After sending rounds of query letters I had four requests for full manuscripts. For those of you who haven’t been through this process this means that I had sent flawless, artfully crafted, intriguing, (yet humbly self-effacing) one-page letters (with sample pages, if requested) to a carefully researched list of agents. I had included recent comparable titles (“comps”), I had a hook and elevator pitch, a brief bio. Now, this is a whole ‘nother blog post, so I won’t go into more detail. But anyway, what happens is that the agent’s assistant (most likely) reads your letter and, if it’s interesting, your sample pages. Then, said assistant passed them on to the agent, who might read them that day (my fastest request for a full was 6 minutes) or might read them in four months. If the agent is interested, the assistant (or maybe the agent) will email, asking for more pages. And here’s where the waiting bit comes in. I had several agents hold onto my manuscripts for up to four months, even though I let them know that fulls were being considered elsewhere. Somewhere between the third and fourth month of waiting it hit me like the clapper of a gong: they don’t need me or my novel. They have stacks of good stuff to choose from. Yet, while this is true, somehow agents need to find work that they believe in and want to represent. Okay, I have totally wandered away from my opening premise. (must edit). Yes, right, well. The waiting. You have finished your manuscript! Edited, copyedited, formatted. You have come up with a killer title, and admit it, you have already decided who should star in the blockbuster movie (though you’ll keep that to yourself.) You feel cautiously optimistic as you craft your query letter. You research agents, personalizing each letter and submission. Onward. Get it all right. Send the letters. Send requested fulls. Maybe grow out your hair. It’s just a phone call. Don’t overthink it. Repeat. I tried, unsuccessfully, not to focus on the potentially overwhelming fact that THIS WAS THE BIGGEST THING TO EVER HAPPEN in my fairly new writing career. SO, the call happened. I dressed as if I were going into a meeting. Took care with my makeup and hair. And that actually helped. I decided against having that shot of Jack Daniels. I sat in my living room so that my three dogs would not distract me. I had a notepad, a fresh pen. My senses were on high alert, my palms, super clammy. I mean, super clammy. The phone rang right on time and I answered, affecting a “hello?” meant to sound like I was just pulling wet laundry from the washing machine—like it was a normal day and this was no big deal and I was an old hand at this sort of thing. The assistant was on the line, and she connected the agent. I was pleasantly surprised by how warm they sounded, how solicitous and kind they were, how complimentary. The call lasted forty-five minutes. I hung up with an offer to “revise and resubmit” my novel, according to the agent’s ideas. I agreed readily. I was thrilled to have caught the notice of someone at this agency. And she was so nice! But here was the kicker: I had to agree that I would not send the manuscript out to anyone else as long as I was editing based on this agent’s ideas for my work. That was fair. I agreed. Fast forward eleven months. I had completed three exclusive revisions. I did not have a contract for representation. As I ticked off each week between waiting to hear about my revisions and hoping for a contract, I learned to be patient. And let me tell you, it is hard. Every time there was a request for a phone call I thought, she probably hates what I did. She’s going to drop me and I wasted 3/6/9 months. I had no idea almost a year would pass. But it did. And after those 11 months, my novel was better. I spent all of my time and energy on making this agent happy with my work. Happy enough to sign me. I pushed myself. I applied to an MFA program. In November we had another call. As I waited for the days to pass I convinced myself that surely she would not want to continue if my work wasn’t there yet. So, same modus operandi for the previous calls: dress well, paper, pen. Only this time I had a box of Kleenex and I did, in fact, have that shot of bourbon, because I truly anticipated bad news. I re-thought taking a tranquilizer because I figured that if I did I would probably ugly cry on the phone when the bad news was delivered. But after a few pleasantries, here’s what she said: “We need to talk about further revisions.” My heart rose, since this meant she wasn’t dumping me yet, but it quickly fell as I thought, I gave my all to that last round of revisions. I did almost everything she asked, and it’s still not good enough? I can’t do this. I don’t have what it takes. Click on bold type for links. YES! I have a book deal for both of my completed historical novels! YES, they will appear in hardcover, paperback, e-book and as audiobooks! Yes, I am absolutely pants-wettingly beside myself. Yes, there is validation, and my pants would be on fire if I didn’t admit that. There’s some money, which is also really sweet, but what I’m feeling the most right now is GRATITUDE. I’ve had fabulous writing teachers, mentors, and MFA advisors. I had a great cohort (go, Winter, 2018!) in the MFA program at Vermont College of Fine Arts, where I first read my work at Connie May Fowler’s fabulous VCFA Novel Retreat. I had a wonderful writing group at WriterHouse, here in Charlottesville, Virginia. My family is supportive and even though they don’t really understand what being a writer is, they support my ambition and dreams. My agent, Mark Gottlieb of Trident Media Group worked hard to put the deal together and I’m thrilled to be working with the folks at Blackstone Publishing. I’m also grateful for the time I spent at Hawthornden Castle this March and April. It’s an ongoing journey—okay, sometimes it’s been a slog. Along the way, there have been moments of euphoria and tears of bitter disappointment, chasms of self-doubt, nail-biting anxiety, and many, many hours staring at my laptop screen (or into the refrigerator, when I got stuck). I have to confess that there have, and will be, envy and jealousy of talented (younger, prettier) writers whose gorgeous prose or poetry seems effortless, and friends who already have novels in the world. There’s always someone higher up the ladder, right? Along the way, I’ve been trying to stay on an even keel. For me, this requires wine, solitude, wine, long walks, yoga, wine, occasional Ativan, wine, compulsive knitting in ridiculously complex patterns, and often, praying, especially in the dark times, for grace. Because grace, I think, is the most valuable tool available to us humans as we navigate both highs and lows. Grace allows us to accept what feels unfair or unkind. Grace helps us to wait with patience. It asks our higher power of choice not to help us get what we want, but to help us move through the process with self-compassion and acceptance of things that don’t seem to make sense. Sometimes, grace gives us clarity, if not of a specific situation, then of our unique position within that situation. Grace reminds us to pay it forward when we can. I don’t know what’s ahead in this writing journey. Needless to say, there will probably be more lows and hopefully, more highs. To be sure, there will be a whole lot of shameless self-promotion in my future, and more staring at the laptop screen. I’m just starting a third novel now, set in the early 1950s. Here’s just a little bit about my two upcoming books, but I don’t want to give away the plots. Note- it’s possible that titles will change before publication. Excerpted chapters have been published in The Copperfield Review and Deep South Magazine. Click on the magazine title to view. The title comes from a British saying I first read in Nancy Mitford’s fabulous 1945 novel, The Pursuit of Love. As proclaimed by Uncle Matthew Radlett, “the thin end of the wedge” denotes a seemingly insignificant event or action certain to lead to catastrophe and ruin. This novel began in a Fiction class I took five years ago at Mary Baldwin University. My teacher was Sarah Kennedy, a fine poet and the author of THE CROSS AND CROWN series of historical novels. Sarah told us to start a novel. So I did. Then I enrolled in a program at Queen’s University in Charlotte, N.C., called One Book, where I was lucky enough to be mentored by Barbara Jones of Henry Holt &Co. After that, I kept working on this manuscript in the Novel in a Year class at WriterHouse in Charlottesville, VA., taught by the fabulous novelist Mary Kay Zuravleff. I set the story in 1924, at the old farmhouse where I live in rural Virginia. The inspiration for the main character, May Marshall, came from this shard of a porcelain doll’s face I found in the dirt outside the house. I found myself wondering whose doll it might have been and what the little girl’s life had been like here, at Keswick Farm. I tried to imagine what this place was like when that girl was small, and I decided that the 1920s would be an interesting time to write about. Certainly, the twenties were roaring here in Albemarle County, Virginia. During Prohibition, Franklin County, southwest of Albemarle, was called “the moonshine capital of the world.” Locally, according to John Hammond Moore’s history, Albemarle—Jefferson’s County, 1727-1976, bootlegger Bose Shifflett, operating out of Bacon Hollow, was known as “King of the Blue Ridge.” Now, you can’t make this stuff up, so of course, Bose had to have a cameo. In future posts, I’ll write more about the research and inspiration for this novel. In 2017, this manuscript was named a semi-finalist in the Faulkner-Wisdom Creative Writing Competition (Novel-in-progress category), was a finalist in the Tucson Festival of Books Literary Awards, and it won second place in the Novel Excerpt category of the Seven Hills Literary Contest. An excerpt was published in the Seven Hills Review. This novel is what’s called in the publishing industry a “stand-alone sequel,” which means that you could read it without having read my first book and it should make sense. However, some of the characters from THE THIN END OF THE WEDGE make another appearance. The plot is a dual narrative, telling parallel stories with themes of living with a disability, questioning faith in times of adversity, and two women’s unlikely success during the Great Depression. I’ll be writing more about this one in later posts, but the plot centers on events of the summer of 1932. In the spring of that year, a grassroots uprising began in Oregon when eight American veterans of World War I started a cross-country protest march to petition Herbert Hoover to pay their war bonuses early (they were slated to be paid in 1945). By the time the men reached Washington D.C. they had picked up support and 17,000 veterans had assembled from all across the country to join the March, many with families in tow. They camped out along the rivers and around the Capitol, in rough shacks and tents and sometimes in partially demolished office buildings. In a terrific publicity fail for Herbert, the term “Hooverville” was coined for the encampments that populated D.C. and continued to spring up in cities across the country throughout the Depression. After the Bonus Bill was defeated in late July, President Hoover ordered General Douglas MacArthur to lead troops in tear gassing the bonus marchers out of the camps. More later, as we lead up to publication! Meanwhile, I hope you’ll check out my new author Facebook page. I’ve also made an Instagram page dedicated to The Thin End of the Wedge, which you can follow if you like by clicking here. Let me say one thing. Well, two things, actually. The first is that I never thought I’d be chosen as a Hawthornden Fellow. But I filled out the application in the hopes that maybe, just maybe, no other applicant could make it in a particular month—January, for instance, or someone might break a leg, or whatever, leaving a spot for me. Then I chickened out and told the nice folks who had offered to write recommendations for me ‘thanks, but I don’t qualify.’ Then, I decided I really, really wanted to try for it, so I did. The second and far more important thing is this: I am profoundly grateful to the late Mrs. Drue Heinz and her committee, and to Hamish Robinson, the administrator of Hawthornden, for the opportunity to spend a month here. While the initial awe has mellowed over my four weeks here, it will never go away. For eight months of the year, five or six writers are invited to spend a month at Hawthornden Castle. Novelists, playwrights, screenwriters, poets, etc., from all over the world may apply. The daunting eleven-page application must be requested by mail, from Scotland, and returned, hand-written, to the administrator, also by snail mail. Aside from a few housekeeping rules, the main thing is that silence be maintained from 9:30am until 6:30pm, every single day. There is no internet available to Fellows and very spotty cell reception. In short, it is a place to write without distraction, while the lovely staff does one’s laundry, fixes one’s meals, and tidies one’s room. For an entire month. In Scotland. No, I’m not making this up. The chef, Ruth Shannon, provides wonderful traditional Scottish fare for dinner: Comforting fish pie on snowy nights, roast beef with Yorkshire pudding and perfectly roasted potatoes on Sunday. And her puddings! Her almond cake, her berry Charlotte, her trifle, and that chocolate soufflé! Her first cookbook is in print and another is in the works. The writer’s bedrooms are named: Boswell, Evelyn, Herrick, Bronte, Milosz, Drummond, and I was in Jonson. Upon arrival, I unpacked my family photographs and pictures of my three dogs, my yoga mat, hiking shoes, and the three craft books I brought along: Janet Burroway’s Writing Fiction, A Guide to Narrative Craft, John Gardner’s On Becoming a Novelist, and a small volume called “It was the best of sentences, it was the worst of sentences,” by June Casagrande. The first two I read almost daily, as a religious person might study a devotional. Burroway always delivers when I have a writing problem or question. (I understand that the book is being re-issued soon, minus the anthologized stories she uses as examples.) Casagrande’s book I did not get to. I’m hoping it will help with my comma issues, but that’s another post entirely. Our days here are for work, beginning after breakfast and broken by lunch and perhaps an afternoon walk. Sometimes I’ve done yoga in my room, trying not to knock over furniture and stifling my groans of pain, so as not to disturb my fellows. In 1982, Mrs. Heinz refurbished Hawthornden Castle and turned it into an international writer’s retreat. Located about 25 minutes south of Edinburgh, it boasts a 15th-century tower and a commanding view of the River Esk and surrounding woods. The Castle was enlarged and partially re-built by the poet and historian William Drummond, in 1638. In 1842, Queen Victoria visited one of Drummond’s heirs, and the caves below the Castle were, reportedly, lined with velvet for the occasion. When Charles Dickens dropped in, unannounced, it is said that he was turned away by the housekeeper. His rockstar status had no currency at Hawthornden, apparently. I asked if there are ghosts and Hamish said no. But one night, when I was having trouble sleeping, I rolled onto my side and pulled the duvet around my shoulders. Behind me, I felt the distinctive footfall of a cat landing on the bed, behind my back. I gasped, and turned over, alarmed, but there was no cat. And yet, I was sure I had felt those four light paws sink into the coverlet as if it had jumped from the empty bed next to mine. Super creepy, I won’t lie. But it didn’t happen again. My Fellows for the month are three novelists (two American, one Scot) and a young American playwright. ** As the weeks pass, I’m increasingly awed by their talent. In the evenings, we sit by the fire in the drawing room, sipping wine or Scotch, and take turns on alternating nights, reading our work aloud or having it read by the others. I’ve never seen a moment of competitiveness (Bananagrams excepted), or envy, among us. We’ve bonded over how to efficiently operate the antique plumbing and where Wi-Fi is to be found. In our fourth week together, we are as adept at the Victorian plumbing as, well, the Victorians. We’ve shared stories of children, husbands, lovers and parents, success and self-doubt. Some of us received letters and two of us ordered the same beautiful, wine-colored suede boots. At the end of our first week, we started playing Bananagrams after dinner. I had never played before, but Sheena insisted this was much more fun than Scrabble, and she was right. The second week, Sheena taught us Dirty-Made-Up-Bananagrams. For example: VIBROID, CHUND, WEANOLE, BUMFO, PENISTATE, NARTY. You get the idea. Shortly before I left to come here, my first novel went out on submission to publishers. For non-writers, this means that my literary agent has sent out my manuscript to potential editors in hopes that one (or more) might love it, fight over it, and want to publish it, offering a multiple book deal with film, audio, and foreign rights. It’s nerve-wracking, I won’t lie. So, while here I’ve been finishing the draft of my second novel. As I pack up to leave it stands at 372 pages and 115,000 words. I can’t say how many words I’ve added or cut, but I have done what I hoped to do, which was to connect the narrative pieces I already had and edit the thing. For instance, I spent an entire day doing a word search for ‘was,’ (1289 appearances to>1125) and another morning on ‘had,’ (990>784) with the intention of eliminating the dreaded passive voice. When I get back there is still work to do. The manuscript needs copyediting, it needs to be read by beta readers, then I need to read it out loud to myself and, finally, send it to my agent. Although my MFA advisors, workshop members, and writing group have read parts of this, no one, except me, has read the entire thing. So, there’s that to be dealt with. During my stay here, I’ve had to wrestle with the possibility that my first novel won’t sell. Apparently, this is the case for many writers. I have found myself, on several occasions, wallowing in self-doubt, thinking what am I doing, writing a second book if no one wants my first? Am I an idiot to keep at it? I haven’t had an answer to that yet, but I figured that now is really not the time to have an existential writing crisis. Today, one of our last, my afternoon walk followed deer trails through the high woods and I crossed a steep waterfall via a fallen log, all the while telling myself that if I fell, no one in the entire world knew where I was and if I screamed it was doubtful that anyone would hear me, except maybe the three horses I passed earlier. But there was no drama, except muddied shoes and some truly ungraceful fence-hopping. The North Esk runs below the Castle and walking trails wind down to a cottage ruin called “The Maiden Castle,” situated at the spit of land where the river turns back on itself. On my first trail walk, I was nervous and very cautious, afraid of falling in the thick black mud and afraid, also, of getting lost in the woods or tumbling down the steep banks into the frigid North Esk. (How embarrassing would that be—drowning on my first day?) On subsequent walks, I would venture farther afield and fall in the mud once or twice, though not over a cliff. On my rambles, I found shards of blue and white pottery and tumbled glass along the riverbank. In the newly plowed field adjoining the library, pottery shards flash in the furrows. Today, I gathered a pocketful of colored ones. To me, these are treasures I’ll take home, but to the farmer, I suspect they are no better than gravel. Now, as I write this, the rain has begun. We’ve had a snow-globe snowstorm and plenty of rain, and lots of sunshine. When we arrived, the snowdrops were blooming and as I prepare to leave there are seas of daffodils and pink wild cyclamen on the banks. I am snug, in my little room with its Laura Ashley fabrics and ruffled lampshade, pine desk, and fireplace. And I am filled with gratitude—not only for the Fellowship, which is so generous—but also for the friends I’ve made, for the time to do what I love, and for the family I left behind, who allow me the freedom to be here. While I was in residence, out benefactress died, here. I wrote her a note of thanks after I received my acceptance, but I’ll never have the chance to tell her how much the experience has meant. I leave Hawthornden today, feeling full of gratitude. I hope she might have approved of our word games and laughter and cheers of appreciation for each other’s work. Rest in Peace, Mrs. Heinz. Now that the great grizzly Creative Thesis has been turned in, my large collection of yarn and knitting patterns has come out, calling to me, ‘hey, when are you gonna start on those Christmas presents, missie?’ I’d like to try some of these little mousies. Deathflake mittens : (pattern free from Ravelry.com ) uses teensy, tiny needles, but it’s a fun pattern in Shetland wool shades of plum, indigo, peat heather and violet with cream. This pair will be for a friend, but I’m planning a pair for myself in hand-dyed charcoal gray with white. I’ll switch out the skulls on the cuffs for fair-isle rib. Chilly November afternoons are perfect for long walks while listening to books. Right now I’m listening to Elizabeth Von Arnim’s The Enchanted April, a fabulous British comedy of manners published in 1922. (Think Jane Austen in the 1920’s). And below, is what I’ll most look forward to for 2018! From mid-March to mid-April I’ll live in Hawthornden Castle, along with five other international writers who are strangers to me. No speaking is allowed in the castle between the hours of 9:00am and 6:00pm. Writing, long rambles in the woods, some good Scottish knitting yarn and I’ll be in heaven, thanks to Mrs. Drue Heinz and her fellowship committee. In print now in Gargoyle Magazine #66. In the early 1980’s it was generally considered safe to hitchhike on Nantucket Island. At least, those of us who had only just graduated college and come for the summer— career-less and broke—found it an economical and efficient mode of transportation. And we never hitchhiked alone. After all, this tiny (45 square mile), quaint island thirty miles off Cape Cod was a little paradise, ripe with opportunities to waitress in wildly expensive restaurants and babysit for or clean the vacation homes of reclusive celebrities. Our parents, of course, would have been appalled. We were a pack of four Southern Gals, newly graduated from a small all women’s college in Virginia. (Then, we called it “all-girls”, not “all women’s”.) We had arrived on the ferry from Hyannis after a long drive packed into my Ford Mustang and we would spend our first night on Island at the poetically named Flossie’s Flophouse. The Next morning, we would take possession of a rented ranch house that had been sold and emptied out. Renovations were to start in September after we left and the realtor tossed in two mattresses and two box springs and a sleep sofa with no cushions that never stayed folded closed unless you sat on it. The house also included a mystery male roommate, who used everyone else’s shampoo. By the end of the summer, an additional couple had started living in the attic. That whole summer, we slept on either a mattress or a box spring in alternate weeks. Aside from the aforementioned sofa, the balance of out furniture consisted of creative assemblies of stolen plastic milk crates. But we thought it was all pretty great. The night I write about in “Confab” is fictional—well, the climactic part is. The amount of truth peppered through the tale might vary, depending on whom you ask about it. It’s more of a composite of the events of that summer of 1981 than it is a snapshot of one night. What started out as a re-telling of drunken high jinx morphed, as I wrote it, into an exploration of regret and shame and how quickly life can change when you aren’t paying attention. The Copperfield Review is an online literary magazine connected to a publisher of Historical Fiction called Copperfield Press. An excerpted chapter from my novel manuscript appears in their Summer 2016 issue. To read the chapter, click here. For more information on any of the places and things mentioned below, click on the highlighted text. The setting of this chapter is the historic Jefferson Hotel, in Richmond, Virginia. The year is 1924. The Jefferson was built in 1895 and is considered a fine example of the Beaux-Arts Style of architecture. In 1969, it was added to the National Register of Historic Places. In 1924, when the scene in my manuscript takes place, the Jefferson was a hub of social activity. Live alligators lived in the marble pools of the palm court. The Jefferson website tells me that the last one, called “Old Pompey” died in 1948. Radio helped to popularize Jazz music in the early 1920s, and live broadcasts were extremely popular. Along with the changes in fashion, the changes in popular music encouraged dancing and dance contests. Dance marathons became a thing all over the country. To watch a video of a Charleston Contest, click here. Contests, fads, and publicity stunts—such as flagpole sitting, aeronautical shows, and beauty pageants—were tremendously popular. Of course, in 1924, Prohibition was in effect so party-goers would have brought their own bootleg liquor or moonshine to a dance at the Jefferson. I did not know until I started doing research, the difference between a bootlegger and a moonshiner. I thought the terms were interchangeable, but they’re not. A bootlegger smuggled name-brand liquor into the country to resell it illegally. A moonshiner manufactures illegal liquor. Photos- (left) from thejcconline.com and (right) weebly.com. During Prohibition, bringing liquor into public places was a challenge, but any clever flapper knew how it was done. Chapter 8 of my manuscript tells the story of a dance contest at the Jefferson Hotel. My central character, May, is coming to Richmond from Keswick, Virginia, then over two hours away from the pulsing metropolis of Richmond. Her home, Keswick Farm, was built about 1825. It is the opening setting of the novel, and where I live now. The original inspiration for the story came from a shard of porcelain I found in the dirt here. It’s sort of spooky, isn’t it? I wondered whose doll it had been, and then I wondered about the little girl who owned it. What had her life been like at here, at Keswick Farm? Please read the chapter, and let me know what you think. I love to travel. And I always love to come home. I love Paris. I love Paris any time of year (although April can be cold and rainy, and gray.) I will return home tomorrow after sixteen days away. During my stay in Paris, a crazy man in a truck killed a lot of innocent people in Nice. The next day, flags flew at half-mast in Paris. We were at Versailles, celebrating Bastille Day, riding bikes through the grounds and watching fireworks at eleven p.m.
We returned to our hotel room and the sobering news about Nice. We enjoyed Paris and went on to enjoy Valencia, eating paella on the beach at Ernest Hemingway’s favorite spot. I am ready to get home now, to see my family, and my dogs and my garden. My daughter wants to get back to her friends and her new apartment. So we have memories, and photos, and mementos, and best of all, a family and home to return to. We are all shaped by our experiences—what is inflicted upon us, opportunities we are given, and the things we choose for ourselves. There is choice, and there are also elements variously called “luck,” “fate,” “divine providence,” and “coincidence.” My friend Aggie once told me that she had heard a saying: “Coincidence is God’s way of remaining anonymous.” At the time she told it to me, my own mother had just been diagnosed with the stomach cancer that would take her life within a matter of months. Google tells me that Albert Einstein was the author of that quotation. I find it humbling that a genius of such magnitude found space among his calculations for God. But coincidence does play a role in our lives. So does fate. So why are some destined to die of cancer? Or Alzheimer’s? Or a car accident? When my mother was ill, Hospice helped to care for her in her final days. I was so impressed by the organization that I signed up for volunteer training at my local non-profit Hospice. I never would have signed up before my mother was diagnosed. But my experience with my mother’s cancer shaped me. I became a volunteer, going to patient’s homes to sit with them so that their caregivers could have a few hours respite. Being inserted into a household where someone is dying is delicate, and requires equal parts sympathy (or empathy) and detachment. I know that detachment sounds like coldness or distance, but it’s not the same thing at all. In being detached, I can get done what needs doing, and allow the caregiver to take care of his or her own needs, if only for a few hours each week. After three years, I requested that I not be paired with any more patients. I needed some distance. I found I was becoming more than detached. I was becoming cold because I needed to separate myself from the need and pain and grief I saw. Now I work in the supply room at the Hospice office. I fill orders for nurses, filling shopping bags with products with ambiguously optimistic names like Skil-Care, Med-Pride, and Primaguard. Anything manufactured by a company called Caring, must, to some perhaps subconscious degree, provide a modicum of comfort. As if someone could fly away from their deathbed on a green absorbent pad. Facial tissues, which, personally, I always call “Kleenex” are called “Envision.” And a paper towel? Not a paper towel, but a “Preference” towel. Pull-ups are still pull-ups but are available only for those below the poverty level, who might not have indoor plumbing. When were are caring for someone at the end of life, we need all of the confidence available. If it comes in the form of a gauze pad or alcohol swab, who cares? The nurses and aids phone in lists of supplies they need. End of life, they call it. Because it can take a while. Death is an instant. End of life can be the final days or months of a terminal illness. My work at hospice is but a drop in the bucket. These brave, dedicated nurses and volunteers look death in the face every day, and say, “You may win this one, but I’m here to ease the journey.” Their patients won’t get better. These patients won’t go home with balloons and wilting flowers. But the nurses keep helping. Has my writing been influenced by my own experiences? Of course it has. Our imaginations are fed by experiences, whether they be the result of choice or fate or providence. Since the mid-1980’s, my family has been going to the same resort in Cancun, Mexico, for a week each winter. The place is old school; low rise, with well-manicured grounds, white stucco walls, and red tile roofs. There are lots of retirees, and many families, who re-connect from year to year and have watched each other’s children grow up and buy timeshares of their own. In March of 2015, I was there with my husband and daughter. I was determined to write a short story, and I had a hard time settling on what to write about. Sitting beside the pool one afternoon, I watched a young father follow his toddler around the pool deck, lap after lap after lap. I remembered those days with my own daughter, and I felt a pang that I could only describe as a mixture of relief and nostalgia. “Brainfreeze” was inspired by that young father. You can read it here, at Rum Punch Press. I had the extreme good fortune of spending a month in Paris this summer. The first week I was there I participated in the Left Bank Writers Retreat, led by the fabulous Darla Worden. I highly recommend it. On one of our forays, we visited the haute taxidermist’s shop, Deyrolle, at 46 rue du Bac, where they have been selling everything from exotic butterflies to ostriches to black bears since 1831. The Jardin du Luxembourg, where my writing group met every day. It was a hot day in June, and as I climbed the stairs to Deyrolle, I was feeling the summer heat. I had been to the shop before and I didn’t like it. On this day, I felt agitated, hot, and hyper-aware. I looked around quickly and went back downstairs to wait for my group. When Darla asked me how I liked it, I told her I didn’t, and that I knew it sounded “woo-woo” but I felt like I was picking up some sort of energy from the taxidermy. Perhaps I was just being anthropomorphic, I don’t know, but it made me uncomfortable enough to leave. The following week, when I was on my own, I visited the Musee de la Chasse et Nature, 62, rue des Archives, in the 3rd Arrondissement. I don’t know how to describe it, except that it is in the Hôtel de Guénégaud (1651-1655), a fabulous seventeenth-century house with a courtyard. The museum displays antique firearms, trophies, tapestries, and paintings, but also fabulous contemporary works. 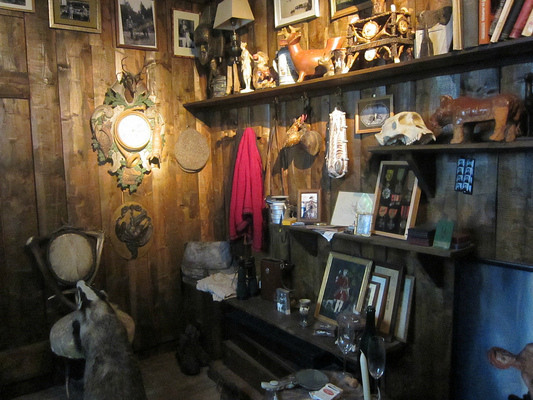 There is a small room decked out as a kitschy hunting lodge by American artist Mark Dion, that has a definite Wes Anderson vibe. I had a similar response to the animals there. It was visceral, but then again, there were some creepy exhibits. The one I wrote about is called “La Nuit de Diane” by Jan Fabre (pictured at top of page). 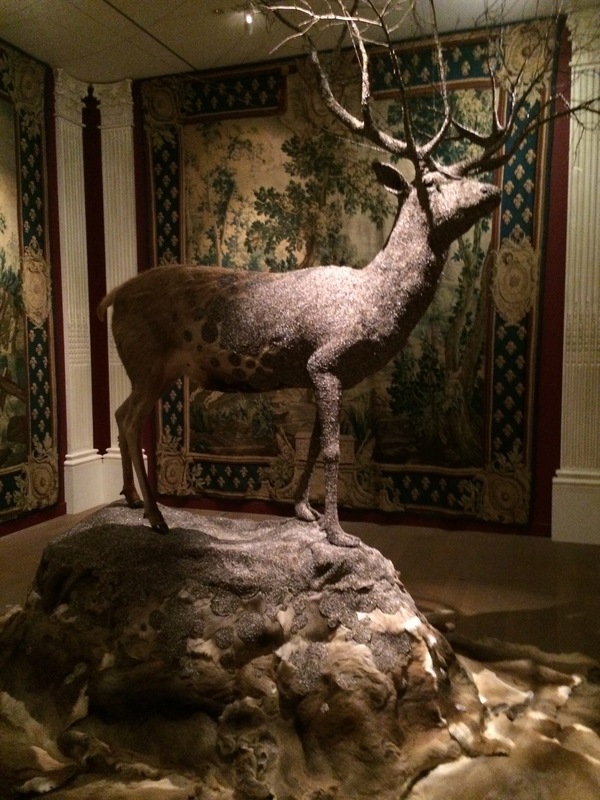 Mark Dion’s Hunting Lodge installation. After I left the museum I was haunted by multiple reactions to the exhibits– visual, physical and emotional. I have never had such a physical reaction to art before. I had to write about it. 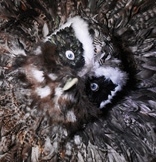 When I went back and read about Fabre’s piece, I learned that his owls have human prosthetic eyes, not avian. My friend Nita Ann read my story and said that it reminded her of the Rod Serling T.V. 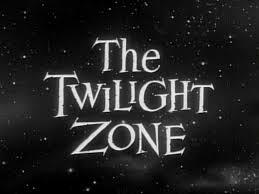 show, “The Twilight Zone”, which we used to watch as kids. How very apt. Isn’t that just another name for Fabre’s “passage from life to death”? 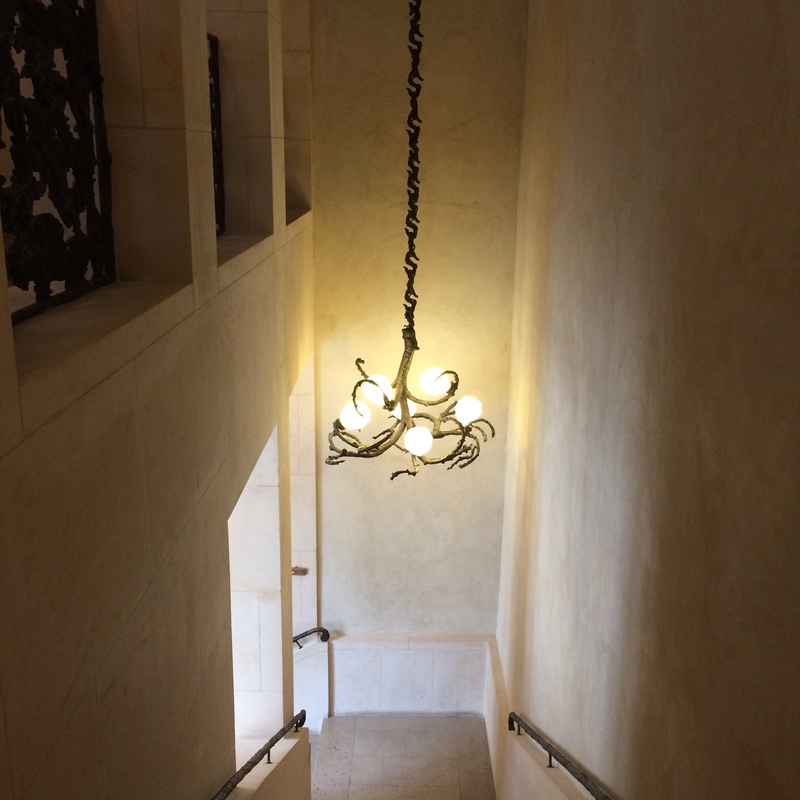 The central stairway in the museum. Here is the link to my story, which was published in August in Ekphrastic: writing and art on art and writing. Sign up for publication and appearance news.